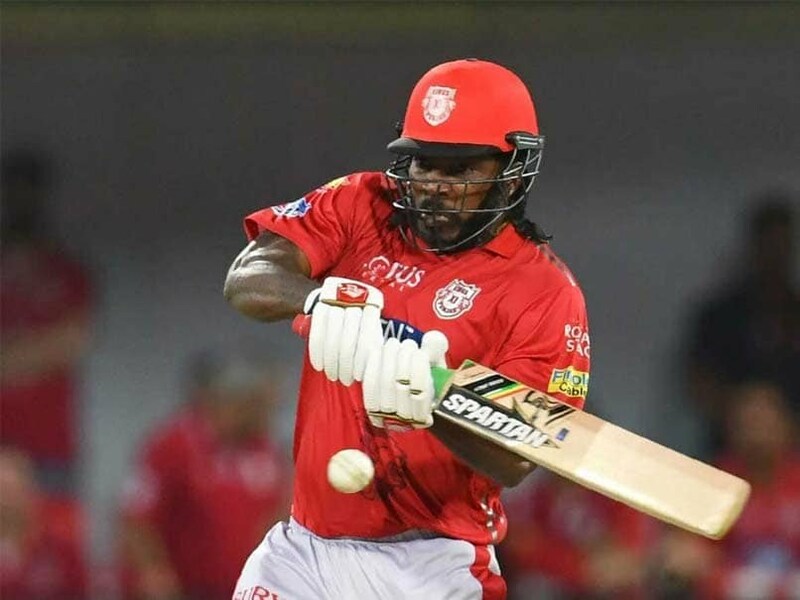 Chris Gayle scored a scintillating 79, as Kings XI Punjab defeated Rajasthan Royals by 14 runs at the Sawai Mansingh Stadium in Jaipur on Monday. After being put into bat by Rajasthan skipper, Punjab started poorly as they lost Lokesh Rahul who was caught by wicket keeper Jos Buttler off Dhawal Kulkarni for four. The pair of Gayle and Mayank Agarwal added 56 runs for the second wicket, before the latter fell to a brilliant catch at long off by Kulkarni off Krishnappa Gowtham . The 39 year old Jamaican left handed batsman along with Sarfaraz Khan stitched together an 84 run stand for the third wicket, before the former was holed out at midwicket fence by Rahul Tripathi. His knock comprised of eight boundaries and four sixes. The Universe Boss also became the fastest to score 4000 runs, in the Indian Premier League. Sarfaraz’s brilliant cameo of 46 at the end, helped Kings XI Punjab post a challenging total of 185 in 20 overs. Ben Stokes was Rajasthan Royals best bowler as he claimed 2/48, while Kulkarni and Gowtham bagged a wicket each. Chasing a target of 186, the opening pair of Jos Buttler and skipper Ajinkya Rahane got Rajasthan off to a brisk start, as the duo added 78 runs for the first wicket, before the former was bowled up by his counterpart Ravichandran Ashwin for 27. Buttler along with Sanju Samson batted sensibly as they added 30 runs, before the former became the first victim of Mankading by Ashwin in the history of IPL for 69 runs. The dismissal of 28 year old Butler changed the complexion of the match, as Rajasthan Royals in quest for some quick runs lost Steve Smith, Samson, Ben Stokes and Rahul Tripathi cheaply, as the visitors were restricted to 170/9. Sam Curran, Mujeeb Ur Rahman and Ankit Rajpoot bagged two wickets each, while Ravi Ashwin claimed a solitary wicket. Kings XI next match would be at Eden Gardens against Kolkata Knight Riders on March 27, while Rajasthan Royals will be facing Sunrisers Hyderabad at Rajiv Gandhi International Stadium on Friday. Chris Gayle was declared the Man of the Match. The fifth match of the Indian Premier League would be featuring Delhi Capitals and Chennai Super Kings at Delhi on Tuesday.